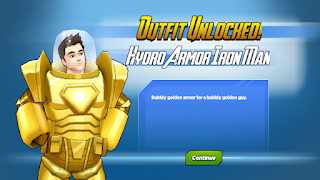 Hydro Armor Iron Man is a new costume for Iron Man which you could get in the Legends Assemble! Special Event 2017. Moon Girl: Cool aquatic armor! What does it do? Hydro Armor Iron Man: The repulsors are adapted for underwater use with an updated tri-beam style unibeam. I gave the rocket boots modified turbines, and the long-range exo-units act as grapples with fully articulated hands! Hydro Armor Iron Man: I know! It even generates an electrical field around itself like an electric eel, and releases an inky black cloud like an octopus! 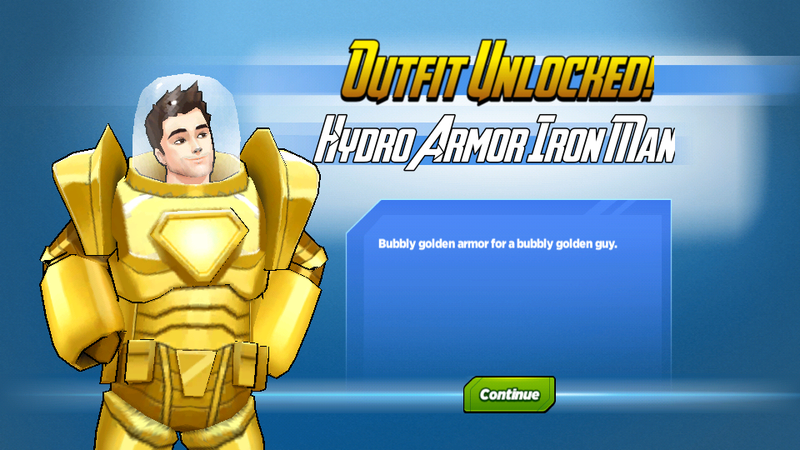 Hydro Armor Iron Man: I know, right?! America Chavez: Looks like you have a shark problem. America Chavez: I can help. 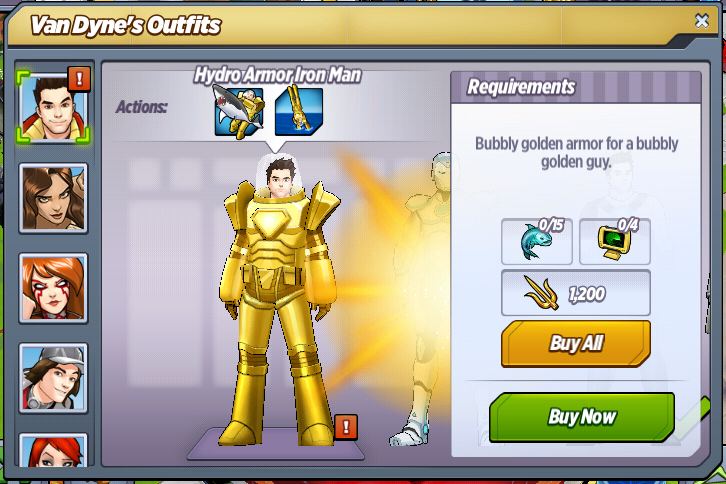 Hydro Armor Iron Man: I'm good. Thanks. America Chavez: I have a lot of experience dealing with sharks. America Chavez: You are not wrong. 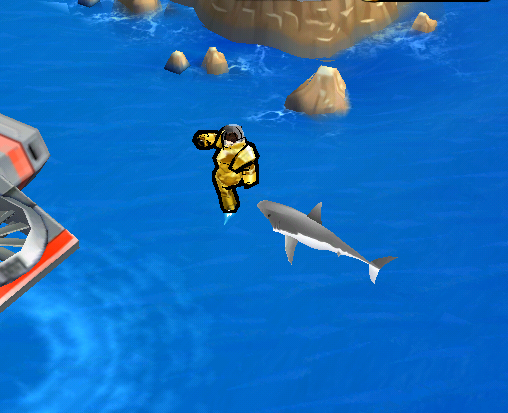 Hydro Armor Iron Man: You want me to be your undersea secret agent? Maria Hill: We need to know exactly how many students they have, and what powers they possess. Hydro Armor Iron Man: Can I have a license to kill? Maria Hill: ...Sure. There's a stack by the door. Maria Hill: Did you have any luck? Maria Hill: Some people aren't cut out to be S.H.I.E.L.D. Agents. Maria Hill: It's not our fault that it goes with everything. Loki: Are you incapable of original ideas? Everyone knows I pioneered golden armor. 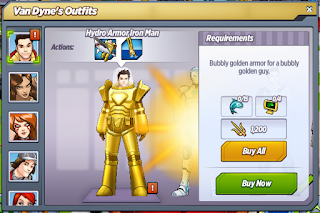 Hydro Armor Iron Man: I thought Odin did it first? Loki: The only armor feature my father pioneered was the elastic waistband. Lemurian: Sharks are the worst. Hydro Armor Iron Man: I know! It's not like this armor tastes good. I tried it. Lemurian: They're just showing off. Sharks think they're so cool, but they're really not. Lemurian: You'd do that for me?! Lemurian: Just so you know, I have a boyfriend. What do you think of Hydro Armor Iron Man? Did you get him?